So you have have received a contractual parking charge notice from G24? In 2010, G24 Limited famously issued a pcn to a coast guard vehicle that was on a 999 emergency. A spokesman for G24 Parking Solutions, which issued the ticket, said there was no one available to comment when approached by the BBC on Tuesday. Colin Ingram said he had parked in the car park because it was the nearest one to the river front at Sun Pier, where a suspected suicide had been reported. Mr Ingram said the reason given for the £95 fine was that he had spent 115 minutes in the car park. 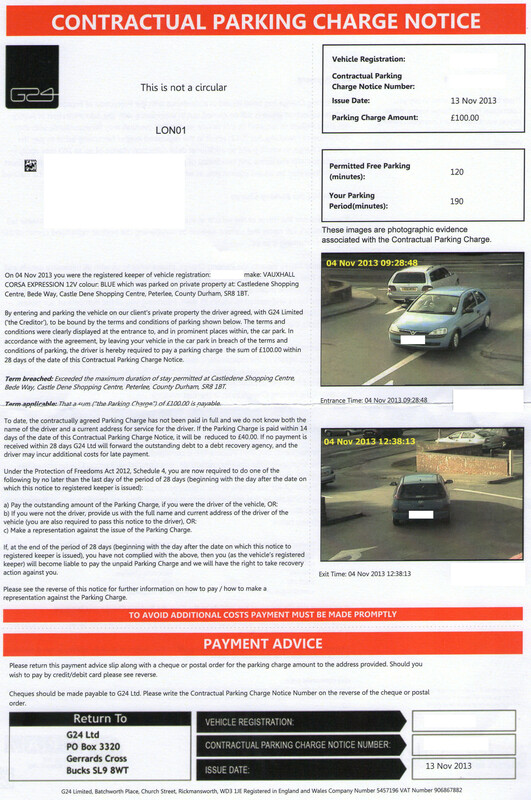 Dionne Russell parked for 40 minutes in a G24 Ltd car park, but then spent 3 hours stuck in traffic trying to leave, has received a £70 parking ticket through the post. Police finally managed to ease the traffic jam, but Mr Dionne’s total time int he G24 Limited car park totalled 3 hours and 15 minutes, some 15 minutes more than the maximum allowed. Ms Russell, says she was trapped in Coventryís Central Six retail park because the traffic was gridlocked. “I have had no apology from G24 Ltd. When I opened the letter I was horrified and rang them right away”. A G24 spokesperson said: “We have no comment. We will wait for the appeal to come through so I can’t comment yet”. See this contractual parking charge notice from G24 Ltd. It shows ANPR pictures of a vehicle arriving at and leaving the car park. It is claiming a fee of $100 is payable, but if payed within 14 days, G24 Ltd will reduced the charge to $40. It also mentions the Protection of Freedoms Act 2012 and thus is claiming keeper liablity under the Act. 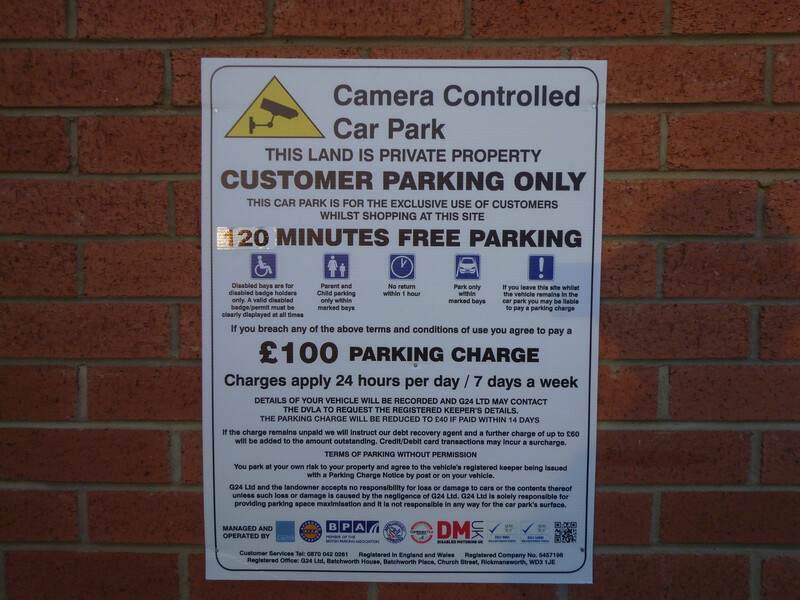 This is an example of a sign in a G24 Ltd car park. The sign says it is for customers only, and that there is 2 hours of free parking. It syas there is a $100 charge for exceeding the time limit.